I left Strathchailleach Bothy fairly late. With only a few kilometres to my final destination I knew it would be an easy day. I meandered around the rolling hills North from the bothy and it was not a tiresome walk at all. By now, my mind and body had been shaped by the landscape. After I rounded the third hill I ascended up over a moorish ridge to finally see the beginnings of the military firing range at Cape Wrath. From my vantage point I saw the fence line and the distinct white, vertical lines of flag poles. There were no red ‘warning’ flags flying. I had checked the notices at Inchnadamph Police Station and the range was scheduled to be inactive. I felt confident. It was safe to proceed. At the fenceline there is a river. Both of these can be breached at certain points where stiles and bridges have been installed by the MOD. Once here, you must ascent a steep couple of hills until you finally see what you are looking for. From this hilly pass I finally saw the North West Coast. The land’s end. It was a very strange seeing the NW tip of Britain sticking out into the ocean. If you’ve ever sat staring at the maps of the West Highlands like I have, you will know the shape well, but now I was no longer seeing it in topographic form, it was three-dimensional reality. I rounded the track closer, but felt somehow I was cheating this place. I chose instead to approach the Lighthouse across the moorland. A final, voluntary assualt over tussocks and peat hag. It seemed fitting. I went into the walled land of the lighthouse. And there were signs of life here: smoke coming from the chimney of one of the buildings and a pickup parked outside. I tried my luck and knocked, not once, not twice, but three times on the door. Eventually a man appeared in bright yellow wellies and said, “I suppose you’ll be wanting a cuppa tea then!”. So, the rumours are true, there really is a man living up there in Cape Wrath Lighthouse, with a cafe that’s open 365 days a year. The lighthouse and cafe are the only reason you’re allowed to walk through the military range at Cape Wrath. If it wasn’t for John living here, and it being publically owned land there would be no Cape Wrath Trail. Nothing. John was a lovely man, he served me a cup coffee from the hatch and we chatted. He’s been up there on his own since October, sadly when his wife had died. There was an air of tragedy about the place. The lonely widower, living in the lighthouse. Raptured by wind, rain and lightning all year round. Still, he had his three very happy cocker spaniels there to keep him company and I felt so much better knowing that. We chatted for half an hour. It transpired that I was just the second person to visit Cape Wrath that year. I suppose this is one of the quieter parts of Britain in the Winter. I purchased a few supplies from John, and he kindly gave me a tin of beans included in the cost. But I politely turned it down as I didn’t have a tin opener. John then went away returned to give me rusty tin opener to take away with Kearvaig Bothy with me. I asked about the bothy and he showed me a map there, as well as a route out to Durness (see as the ferry does not run through Winter). His OS map was covered with unusual markers and he explained that these were all unexploded bombs. There were hundreds of them, mainly on the North-facing cliffs. Thousand-pound bombs blasted in from battleships, he told me. He reassured me that the walls he lives in were three-feet thick. But even so, living near a military firing range myself in Essex, I know how loud these bombardments can be, and they rattle the windows. I was the first Cape Wrath walker John had met that year. I don’t think John was expecting me, but I was really happy to give him some company just that brief while. I thought of John with his dogs as I walked the 7 miles down the track to Kervaig Bothy. It was a simple track walk which apparently was tarmac’ed in 1912 to being supplies to the lighthouse. Then, the lighthouse was manned by several families. It became automated in 1991. The track out to Kearvaig was a bleak, strange landscape. The wind was playing shove with me for the whole duration. It did have me over on my hands a couple of times, as I battled with the winds of the North Atlantic. Eventually I reached the turning off to Kervaig Bothy. And it was a quite a sight. The bay is enclosed by cliffs and sea. The bothy sits on lush, flat pasture and several deer had placed themselves there to graze. 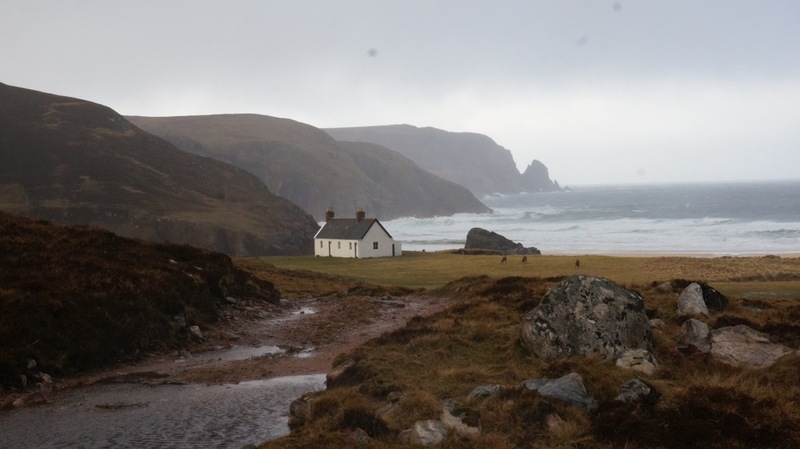 Kearvaig is a beautiful, semi-detached building with, in fact two bothies. One of them has an upstairs, enough for a squad of troops, one is a single room with a fireplace. They have been fitted out beautifully by the MBA. 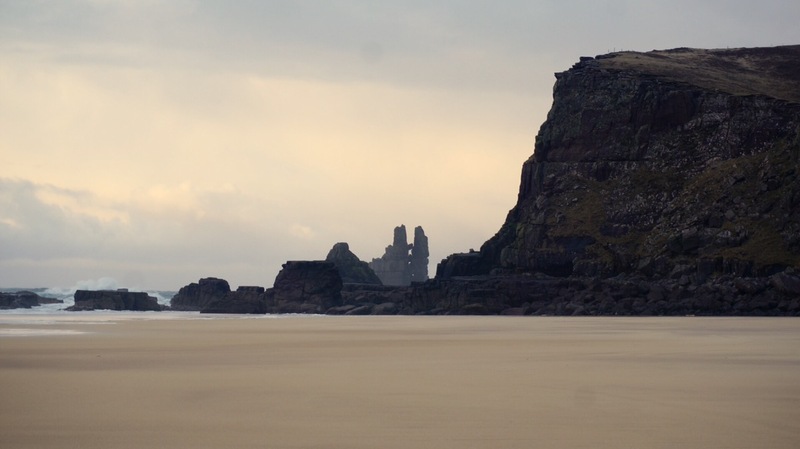 Whatsmore it sits on its on private bay with pristine sand, and a view of a dramatic sea stack that looks akin to two hands held together in prayer. It is an awesome place in the true sense of the word. I took the Westend Bothy, it was smaller and therefore easier to keep warm. I collected more driftwood for the rest of the afternoon before nightfall. Mainly dry heather, which burns like nothing I have ever known – faster than birch twigs – with a furious heat. It will give you a brew in five minutes. I made my cosy fire and watched it burn out and smoulder. I left a log on, and drifted off to sleep, watching the flames lick and occasionally spit out red embers. It was a calm night, and there was not a single draught in the room. Cosy, quiet, peaceful solitude. I had made it to Cape Wrath.